When I was a teenager and undergraduate, still burdened by the invisible mental scars that come from attending an all-girls school and therefore terrified of fat or calories in all their forms, my go-to lazy dinner was a plate of scrambled eggs on toast. To this toast, I would add no butter, convinced that the tiny quantity I used to barely grease the saucepan for the eggs would be sufficient decadence for one meal. My present-day self looks back on her slighter, neurotic past version with pity and scorn. An unashamed butter addict, I have long been aware that scrambled eggs on toast without butter is an utterly pointless endeavour. The butter is such an integral part of my all-time favourite comfort food that you may as well not bother if you’re going to shy away from it. It’s the same with focaccia. Unless you’re willing to be heavy-handed with the oil and salt, you may as well make tortillas. Or an egg white omelette. Or a kale smoothie. Some of the best focaccia I’ve ever eaten has been so saturated with oil that every bite released more and more delicious, peppery olive nectar. Rather like wringing the water and suds out of a mop, my jaws performed the admirable service of extracting every last drop of oil from the sponge-like crumb of the loaf. Combine this with the salt-flecked, rosemary-strewn golden crust of a good focaccia and you have possibly reached the zenith of all the dizzying heights to which a good bread experience can transport you. Sure, a plain white bloomer can be an excellent thing, and I have a penchant for dark, seedy soda breads (probably the only ‘dark and seedy’ things for which I have a penchant, admittedly), but the rich, melting crumb of a good focaccia may just be my favourite of the entire bread genre. Last weekend witnessed my annual gooseberry hoarding day, in which I go to the Pick Your Own farm, accumulate vast quantities of my favourite underrated berry, and stash them in the freezer for luscious sweet-sour crumbles and cakes in the year to come. Given that I am moving house (and indeed country) in September, I pondered ways to use them up more quickly than over a twelve-month period. 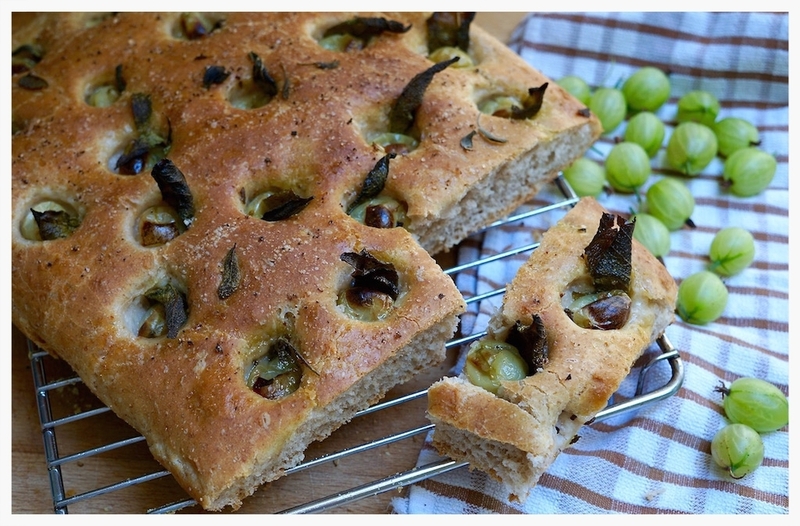 I’ve been longing to make a gooseberry and sage focaccia from Hugh Fearnley-Whittingstall’s Fruit Every Day book for years, and its time finally came. I made a few changes to the basic recipe, adding rye flour for a more complex flavour, increasing the quantity of gooseberries and sprinkling the loaf with a generous smattering of garlic and herb salt before baking. The obligatory drizzle (OK, glug) of rapeseed oil before it goes into the oven gives the focaccia that satisfying moisture and almost buttery taste, while the little pockets of gooseberry and sage in the dough add a hit of fruit, herbal flavour. This is perfect with soft goat’s cheese: the chalky, crumbly cheese offsets the mouth-puckering sharpness of the gooseberries. It would also be good with cured meats and other cheeses, along with a summery salad. I think it’s best when still warm from the oven, slightly crisp on top and gorgeously squidgy and oily in the centre. And don’t even think about being shy with the oil. Remember my tragic scrambled eggs, and live for the moment. Put the flours in the bowl of an electric mixer fitted with a dough hook (or just a large bowl if mixing by hand). Put the salt on one side and the yeast on the other side of the bowl. Make a well in the middle of the flour and pour in the rapeseed oil and water. Knead using the lowest setting on the mixer for 10 minutes, or by hand, until the dough starts to come together (it is quite a wet dough, so persevere). Return the dough to the bowl, cover with a clean tea towel and leave for around 2 hours, or until doubled in size. Grease a large baking tray, around 30x25cm, with rapeseed oil. Scatter it with the polenta. Remove the risen dough from the bowl – no need to knock the air out – and transfer it to the baking tray. Spread it out roughly with your fingers so it nearly fills the tray. Cover again and leave to rise in a warm place until nearly doubled in size and puffed up slightly. Top and tail the gooseberries. Make small indentations in the risen dough using your finger, and place a sage leaf and a gooseberry in each one until you have used up all the berries and sage and the loaf is evenly covered in them. Drizzle generously with rapeseed oil and sprinkle with the salt. Put the bread in the oven and bake for 10 minutes, then lower the heat to 190C and bake for another 15 minutes, until the loaf is risen and golden brown. Remove from the oven and leave to cool for a few minutes on a wire rack before eating (it helps to remove it from the tin while it is still warm). Adapted from Hugh Fearnley-Whittingstall, River Cottage Fruit Every Day!